Sierra Nevada, Spain – History was written today in Spain as French riders Nelly Moenne Loccoz and Chloe Trespeuch, and U.S. Snowboarding members Hagen Kearney and Nick Baumgartner were crowned Team SBX World Champions at the Sierra Nevada 2017 FIS Freestyle Ski and Snowboard World Championships. This was the first time that the event has been featured in a World Championships. Team FRA1 brought a safe win home, ahead of their fellow countrywomen Manon Petit and Charlotte Bankes, after their rivals from the U.S. and Italy each crashed out in front in turn four. 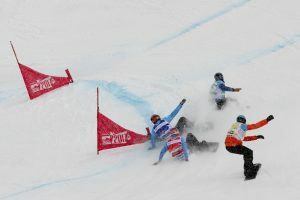 Americans Lindsey Jacobellis and Faye Gulini took the bronze after Italian riders Raffaella Brutto and Michela Moioli were disqualified because Brutto didn’t pass one gate correctly following her spill with Jacobellis. Over in the men’s event, the final featured two tight heats with plenty of passing, drafting and close maneuvers. Kearney and Baumgartner of USA1 came out on top as Baumgartner crossed the finish line one half board length ahead of Lucas Eguibar of Spain, who nevertheless earned his second World Champs silver within 24 hours, this time alongside teammate Regino Hernandez. 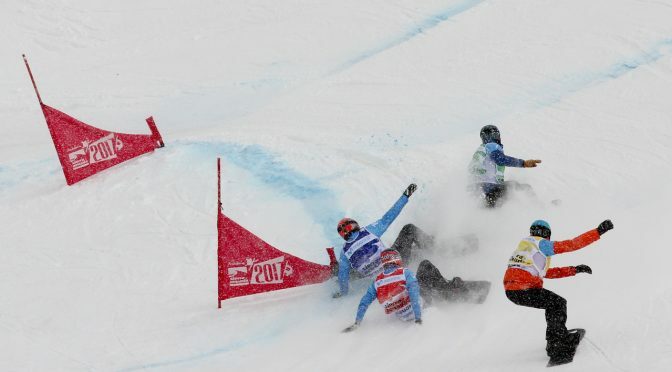 Canada’s Kevin Hill and Chris Robanske rounded out the podium in third, with Austrian duo Alessandro Haemmerle and Markus Schairer forced to settle for fourth. The 12th FIS Snowboard World Championships in Sierra Nevada, Spain continue tomorrow with the parallel giant slalom.